The graph ranks the teams of Major League Baseball according to the price for a beer purchased at a concession stand in the stadium. The smallest beer offered by the Philadelphia Phillies costs 6 U.S. dollars. In its annual survey of concession stand prices in the major professional sports leagues in North America, Team Marketing Report (TMR) examines and compares the sales prices of beer, hot dogs and soft drinks, in areas and stadiums. Comparing average prices of the four major leagues (NFL, MLB, NBA and NHL), calculated by taking into account all teams, customers pay the most for food and drinks at National Football League games. A beer costs 7.42 U.S. dollars on average in 2015, a hot dog 5.29 U.S. dollars and a soft drink 4.79 U.S. dollars at NFL games. At games of the National Basketball Association (2015/16 season) fans pay the second-most on average for concession-stand products with 7.5 U.S. dollars for a beer, 4.96 U.S. dollars for a hot dog and 4.49 U.S. dollars for a soft drink. In the National Hockey League these products are just slightly cheaper with an average of 7.54 U.S. dollars for a beer, 4.84 U.S. dollars for a hot dog and 4.46 U.S. dollars for a soft drink (2014/15 season). Concessionaires at Major League Baseball games (2013 season) charge the least for their products with averages of 5.9 U.S. dollars (beer), 4.52 (hot dog) and 4.19 (soft drink). 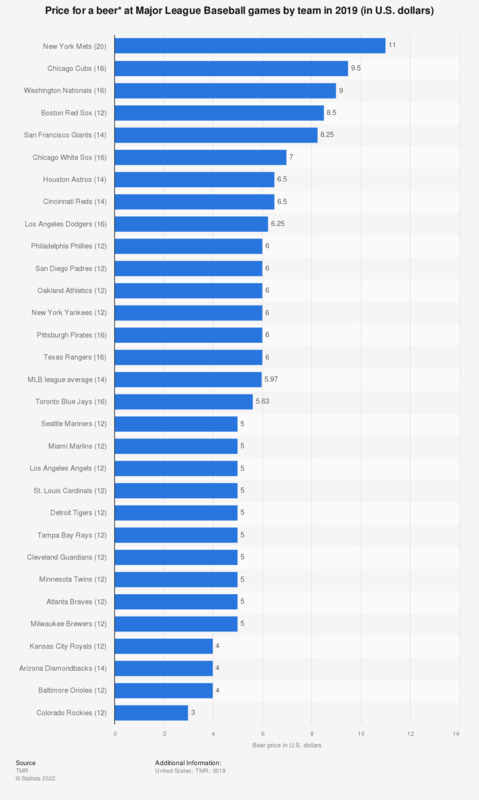 According to TMR, the most expensive beer at Major League Baseball games was sold at games of the Boston Red Sox, the Atlanta Braves and the Philadelphia Phillies, who sold beer for 7.75 U.S. dollars at their arena concession stands. The most expensive hot dog was sold at games of the New York Mets and Miami Marlins, with 6.25 U.S. dollars per hot dog. * Numbers in brackets next to team names denote smallest available size in ounces.